Flat, sandy, arid grasslands characterize the countryside east of Flagstaff, between the wooded hills of the Mogollon Rim and the delicate hues of the Painted Desert. Perhaps the most significant major attraction is the Meteor Crater, which lies 6 miles south of I-40, halfway between Winslow and Winona. This huge depression, 0.74 miles in diameter and 550 feet deep, was created 49,000 years ago by meteoric impact. The crater has been privately owned by the same family and is now a thriving commercial enterprise complete with such amenities as a movie theater, restaurant and gift shop. Entry prices are $18 per adult or $9 per child (free for children under 5 years). Approach from the east or west along I-40, across the high desert of northeast Arizona. The land to the north is part of the Navajo Nation and almost every interstate exit has a roadside Native American jewelry/souvenir store. Frequent signs promote forthcoming attractions, including the movie theater, an interactive learning center, a museum of astro-geology, and views of the crater from the inside and from the outside. About one mile before the crater and its conspicuous visitor facilities, a wide gravel track (Chavez Pass Road) branches off to the right, leading to various ranches and eventually meeting road AZ 87 between Payson and Winslow. It soon passes quite close to the western crater rim, by which time the main road and the visitor center are out of sight. No Trespassing signs posted at intervals are the only deterrent for attempts to reach the crater by this route. The nearest towns with hotels close to the Meteor Crater are Flagstaff and Winslow. There is plenty of selection of low budget motels and more elaborate hotel and spa experiences. The interior of the Meteor Crater is first glimpsed from within the visitor center, which has several observation areas equipped with telescopes to study the distant rock walls in more detail. Outside, short walkways and steps connect other viewing areas. There is one main trail, 1/3 mile around the rim. All hiking must be done as part of a guided tour. A path runs all around the edge but this is now disused, because solo, unaccompanied hiking ceased several years ago. Meteor Crater may seem smaller than expected, not much larger than other less well-known craters like Death Valley’s Ubehebe Crater. It has similar distorted strata around the sides, and the colors of the rocks are muted, generally reddish-brown, though lighter brown around the top of the rim, which is strewn with large limestone boulders thrown up by the impact. 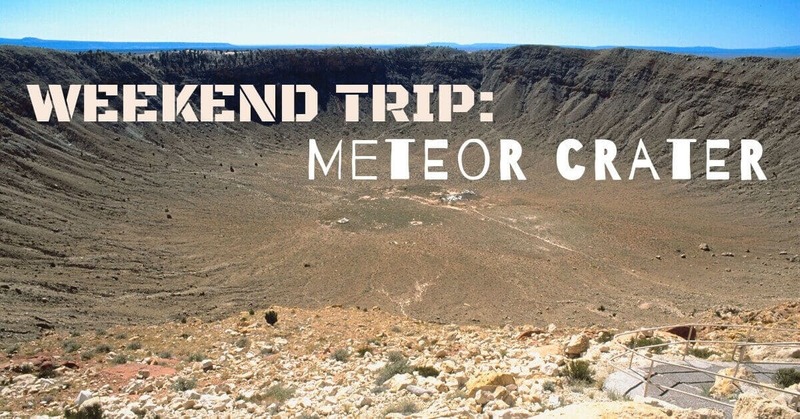 With all of the stairs and varying elevations, the rim of Meteor Crater may pose difficulties for people who are easily winded or afraid of heights, but it is a great sight for thrill-seekers as well as natural-wonder-lovers! The crater was discovered at the end of the nineteenth century by Grove Gilbert, who proved that the crater was formed by impact of a huge metallic meteor, the first and best preserved of (so far) about 150 such craters on Earth to be identified. The main evidence was the large quantities of meteoric nickel-iron rock fragments found in the crater and scattered for several miles around, this being a substance not found naturally in this location. Meteor Crater was blasted out of the surrounding sandstone about 50,000 years ago, and the dry Arizona climate has kept it close to impact-fresh ever since. That stroke of good fortune, however, was wasted on America’s geologists, who for years insisted that the Crater was just another dead volcano. Whenever a big enough rock tumbles from outer space and smacks into Earth, cataclysmic disaster is almost assured. But on the plus side, the resulting crater is now a breath-taking attraction that makes a great weekend trip for us Arizonans! CC Sunscreens knows how fun it is to get away from home for a weekend adventure – but we also know how great it can be to come home, especially if your home has custom CC Sunscreens installed to maximize your year-round comfort. Sunscreens are a great way to control the temperature of your home – and tame your energy bill. With a wide selection of colors and styles, there’s something for everyone. Ready for sunscreens? Give us a call to find out more!